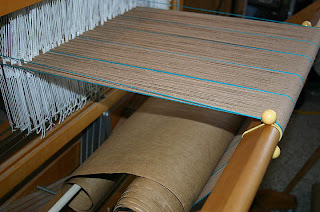 The next step in the towel project was to roll on the warp threads and tie them to the front beam. I love how fresh and clean a new warp looks. So many possibilities, so much potential. 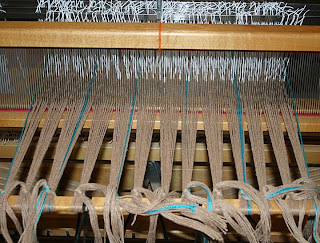 In a first for me, I decided to weave a few inches with five different weft threads, cut the sample off the loom, wash it, dry it, and see what worked and what didn't. 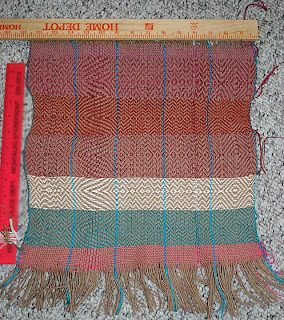 5) pink 10/5 linen (about twice as thick as the 10/2). Pre-washing, the sample is about 14" tall by 14.5" wide - with big bulges where the chenille pulled in and the 10/5 linen pushed out. 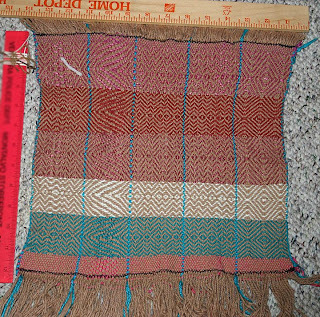 My plan is to weave 3 towels, each about 30" long on the loom. 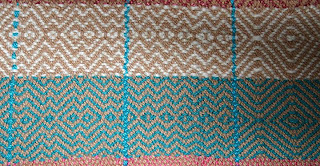 One will use the brick chenille - one will have the color-grown cotton (top sample) - and the third will be the teal 5/2 cotton. I'm setting the linen aside to use in another project. I especially like three treadlings from the pattern gamp but I haven't decided whether I'll do one pattern per towel or a combination. Guess I'll let serendipity (and my interest/boredom level) decide.